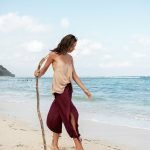 This updated version of our first collection Turbinado Top is crafted with the finest Rayon Crepe and has a halter style neckline with tassles to complete the look. We also brought the back up in order to cover the bra line and brought the v neck down 1″. Watch for our Hibiscus Color Drop for Holiday, it’s going to be so classy and you are definitely going to want it for your wardrobe.